The 2009 romantic comedy starring Academy Award-winner Catherine Zeta-Jones and Justin Bartha ('The Hangover') arrives on Blu-ray in February. In an early announcement to retailers, 20th Century Fox says 'The Rebound' is coming to Blu-ray on February 7. 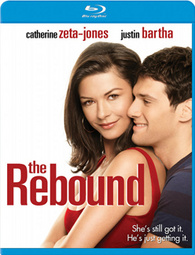 Arriving just in time for Valentine’s Day and featuring electrifying chemistry between Zeta-Jones and Bartha, The Rebound also features fantastic supporting performances from Lynn Whitfield ('The Women,' 'Madea’s Family Reunion'), John Schneider (“The Dukes of Hazzard,” 'Lake Placid 2') and music legend Art Garfunkel. The Blu-ray will feature 1080p video, a DTS-HD Master Audio 5.1 soundtrack, and supplements include cast and crew interviews. You can find the latest specs for 'The Rebound' linked from our Blu-ray Release Schedule, where it's indexed under February 7.